Great Britain's Zac Purchase and Mark Hunter began the defence of their Olympic title by winning the men's lightweight double sculls heats. The duo, who have suffered indifferent form this year, clocked a time of six minutes 36.29 seconds. 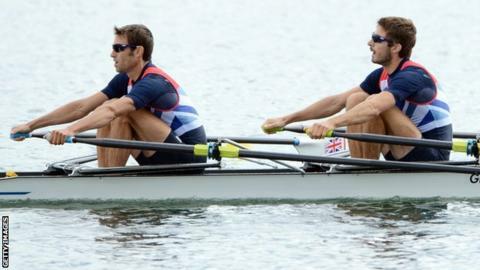 They beat New Zealand by half a length, with both crews reaching the semi-finals at Eton Dorney. Also into the semis are Katherine Copeland and Sophie Hosking in the women's lightweight double sculls. Purchase and Hunter finished sixth at the final two World Cup regattas before the Olympics, appearing out of sorts and dejected in the last event at Munich, which New Zealand won. "The rumours in the GB camp seem to be saying to keep an eye out for the women's lightweight double sculls. You have to have confidence in rowing and these two have that. The Americans are fantastic but when the bubble bursts it really does. GB are very confident and steady, so the rumours with Sophie Hosking and Katherine Copeland seem to be true." But that all changed at Eton Dorney as, roared on by a capacity crowd, the Britons went off hard at the start, pulling out a half-a-length lead over the first 500m. They quickly found a good rhythm, looking very steady as they upped the stroke rate and stretched out. The Kiwis accelerated as they entered the final 250m, but the British responded and crossed the line first, arms aloft and waving to the crowd. "This is the Olympic Games, and it was important to come here and kick off on a good start, show them that we're back and ready to go. We're here to perform and race hard and deliver the ultimate performance," said Hunter. "When things aren't going so well and you're not working well as a unit, you go back to basics. We sat in each other's positions to see what the other was going through, what the others were thinking. We've done all the hard work and strength in the gym and now it's good to get back to racing. "It's a starting point, not an end product. There's still more to come but it's a good place to work from." Purchase added: "It was a really good confidence builder for us, beating the Kiwis who are the in-form crew this season. We knew we had to do a good race. We are pleased to win the heat and now we move on. " The men's lightweight double sculls semi-finals take place on Thursday. Copeland and Hosking, who only teamed up this season, finished fourth at the last World Cup in Munich. But they looked much more composed here as they led from the front. Denmark gave chase, but the British pair had it under control and won by a length from the Danes, with world record holders New Zealand forced into the repechage. The women's eight of Olivia Whitlam, Louisa Reeve, Jessica Eddie, Lindsey Maguire, Natasha Page, Annabel Vernon, Katie Greves, Victoria Thornley and cox Caroline O'Connor could not make it three out of three for Britain, finishing third in their heat. The United States, who have not been beaten since the World Championships at Eton Dorney in 2006, won by two lengths to progress, while Britain must enter the repechage.